Let us take a well known, simple example, used by J. Ledoux in The Emotional Brain, that illustrates how emotions, wired into us by evolution, help us to survive and propel us toward actions long before we have time to engage in conscious thought. We are walking through a forest and we nearly step on a coiled object. We jump back horrified that we may have incurred terrible danger, before looking more closely and seeing that we nearly trod on a coil of rope. Whew, a close shave! What happened here was that we saw something that was potentially dangerous – a poisonous snake! The sight of the coil was the cue that was rapidly assessed by our limbic system, and we jump back and discover that our pulse is racing and we are breathing hard. We just made a preconscious limbic appraisal – is this environmental cue safe or dangerous? These are the elements of emotion in action. Whether or not we consciously recognized our fear, this emotion motivates us to act in the face of danger. If we are walking through the jungle, we are more likely to be vigilant for danger than if we are in our own back yard. Apply this concept to the most important thing in our lives, our close relationships: When we feel safe, secure and loved, we are less likely to be reactive to a moment of disagreement or impatience, whereas when we feel insecure and unloved we may become as ‘on guard’ as we are when we walk through the jungle. 1. Cue – Emotion is triggered by a cue. We are always reacting to external signals received through sensory channels. Distressed couples are exquisitely attuned to each other and react rapidly to facial expressions, body language or tone of voice. One glance of that lowered eyelid or tense jaw signals danger of a partner’s displeasure. Alternatively, a partner may react to an inexpressive face, sensing distance and an indication that the partner is unavailable. 2. Limbic Appraisal – This is a preliminary, rapid assessment of safety or danger that is pre-conscious and pre-verbal. In distressed couples, it becomes the “Oh-oh!” alarm bell in the negative cycle, long before any relationship-threatening thoughts are formulated. 3. Physiological Arousal – Once a cue is appraised as dangerous, there follows a physiological response (heart racing, head-pounding, knots in stomach). The body is preparing for a fight, flight or freeze survival response. Clients are frequently unaware of this response; however, Gottman found that in withdrawn, stonewalling men, heart rate and blood pressure increased sharply in response to cues that their spouses were displeased with them. It seems the body senses before the mind knows. “He is not there for me”; “She is not safe”; “I am failing in her eyes”; “I am not good enough for him”. These attachment meanings, made to explain the bodily felt arousal and the cue we perceived, are responses to the limbic danger bell. The primary feelings such as fear, panic or shame reinforced by such thoughts often go underground after a fleeting nanosecond, and are replaced by secondary emotions such as anger, despair or numbness. 5. Action Tendencies – These are verbal and non-verbal behavioral responses to the fight or flight arousal. They may include total silence or the subtle signs of bodily arousal such as tension in voice tone or strained facial muscles. We all have our own habitual methods of dealing with threat. Some partners pursue, demand and/or attack while others have learned to distance, defend, counter attack or use a combination of methods. These are responses to the momentarily felt attachment panic that had been rapidly overlaid by protective secondary anger, despair or numbness. 6. 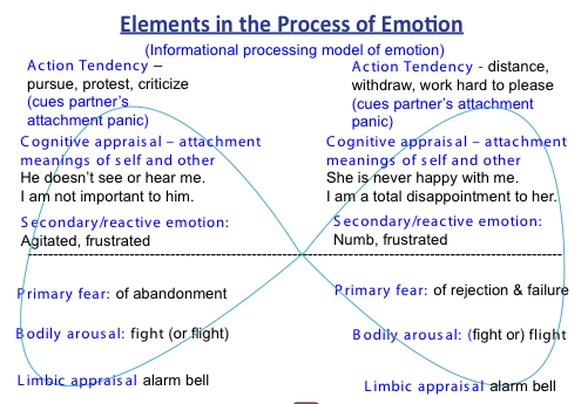 The action tendencies of one partner are then quickly recognized by a distressed partner and in turn become the cues or triggers for the second partner’s limbic brain to sound the alarm bell warning of attachment danger (attachment panic). And once again, primary emotions like fear, panic or shame are likely to be pushed underground and covered with less vulnerable emotions. The partner will more likely engage in his own action tendencies of protective distancing or blaming. The infinity loop metaphor which Scott Woolley developed to illustrate the cycle between partners nicely illustrates the elements of the process of emotion in action: each side of the loops represents one partner as he or she reacts to cues from the other. The entire loop represents how, as a system, each partner triggers and reacts to the other. In order to join with a couple in de-escalating their negative cycle, each element in this process of emotion needs to be noticed and followed (reflected, experienced and shared in dialogue with partners). The elements of emotion which are not apparent or within partners’ awareness need to be evoked and expanded. EFT Steps One and Two typically include awareness of the parts above the dotted line in the infinity loop. These include cues, behaviours, appraisals and secondary emotions. Similarly, actions of withdrawal and distancing can trigger a partner’s attachment panic, often in the form of abject loneliness and fears of being unimportant and abandoned. This helps the client to feel seen and immediately brings down the level of anxiety/ reactivity in the room, which then opens the door for furthering exploration and linking the elements to each other. “What does it tell you when he seems not to listen?” (to evoke this attachment meaning). After validating the reactive secondary emotion in the context of this delineated experience, there is more safety to evoke primary attachment emotions that are minimized, avoided or discounted. Holding in mind the information processing model of emotion as it unfolds in these series of cue-feeling-meaning-action elements (discussed in this article) is immeasurably valuable to the EFT therapist in tracking the cycle and accurately joining with our clients’ experiential worlds while they work to discover their hidden unmet attachment needs. The (physical) feeling is an access road to the initial raw felt sense of attachment panic, the primary emotional experience underlying secondary anger or the numbing that fuels the cycle. This vague bodily sense needs to be up and running so the EFT therapist can help partners move beyond simply naming primary emotions, into processing and reprocessing fears and anguish about being alone and unacceptable, and to eventually risk reaching coherently and clearly for their attachment needs to be met.